Blueberries are easy to grow, super healthy, nutritious and indigenous to North America. They were first loved by American Indians. I started growing blueberries about five years ago, initially in whiskey barrels and now directly in the soil. The most important part is choosing the right blueberry for your climate. I bought our blueberry plants at our local farmer’s market. I specifically asked for an abundant producer as well as one that is easy to grow. Having two different types of plants is good for pollination and also allows for a variety of tastes and sizes. 1) Blueberry bushes can be planted in containers or directly into the ground. Using a container gives you more control over the acidity of the soil – but make sure the container is large enough: blueberry bushes can grow up to eight feet high! Also, make sure there are enough holes in the bottom of the potting container for good drainage. Use a combination of approximately three-quarters peat moss and one-quarter organic potting soil for produce and place the soil at the bottom. If you plant the bush in the ground, make sure to dig out the soil and replace it with the peat moss and potting soil mixture. 2) Keep soil moist, but don’t water log plants. 3) Blueberries are acid-loving plants, so make sure to regularly use an organic fertilizer. Blueberries grow best when the soil is at a pH between 4.5 and 5.5. However, I have found that using organic fertilizer and new peat moss each year works well enough so that I don’t have to monitor pH. I mix about a cup of vinegar in a gallon of water and add to our blueberry bushes about every two weeks. 4) Place a propped meshed net over the blueberries to protect your berries from the birds. I prop mine up with wood sticks. 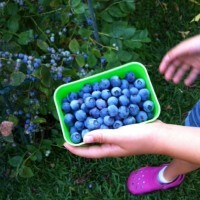 5) Don’t pick the blueberries until they are deep blue. It’s fun to monitor your plants’ progress! Learn how blueberries fliter out UV rays and help lower cholesterol. Thanks Melissa–I’m going to try it!!! I didn’t know about adding vinegar. I will try it. We bought 3 little blueberry plants last year and put them in the ground. They haven’t grown much, but they are still alive at least! I didn’t water them much because of the drought and there are some little tiny blueberries.